Welcome to our online booking page. All classes must be booked through this page. The Studio is not climate controlled so please dress accordingly. We do have space heaters and fans to help make you comfortable. Also, consider that you may be going upside down so please make sure to wear a supportive bra. Comfortable workout clothes are the best. Our studio for mat yoga is at Salt Remedy. Salt Remedy is a health spa in The Woodlands. We offer mat yoga in a private room that disperses medical grade salt into the air. It's like a day at the beach, but air conditioned. The benefits of doing yoga in a room with salty air are almost innumerable, please visit Salt Remedy's Website to read more! Classes at Salt Remedy with Annie must still be booked at the bottom of this page. 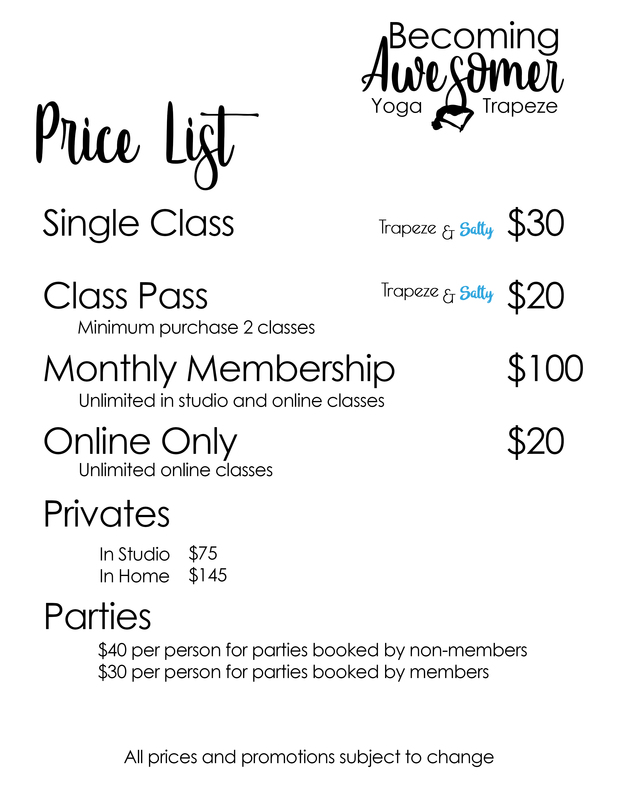 All trapeze and yoga equipment provided. Just bring water and a great attitude! Classes are non refundable. Classes can be rescheduled given 48 hours notice. If less than 48 hours notice is given, classes cannot be rescheduled, transferred, or refunded for any reason. We love kids and they love us. Sometimes we will offer kids only classes as special events so be on the lookout for those! Kids are welcome to observe during any AM weekday classes and of course our Saturday Morning Puppy and Kid class. Kids are not allowed during any PM classes. If you are bringing a kid to an AM weekday class, please let me know prior to bringing them at 361-442-6911 so that we can make arrangements for the kid to participate if there is an open trapeze. Flexibility: practice deep, passive backbends, splits, and hip openers otherwise impossible to do on the mat. Small mat cllass held at Salt Remedy on 1488 in The Woodlands. 4 students will enjoy a 45 minute class followed by a short guided breathing meditation all while receiving a salt therapy. Passes good for classes at the 2920 location and for Salty Yoga at Salt Remedy. Good for any two group trapeze class on 2920. Good at 2920 location only. Good for any group trapeze class. Passes are good for 60 days from purchase and include sales tax. Fun weekend filled with lots of girl time. Come hang out with us and get some rest for your body, mind, and soul. We will work on finding balance in the chaos of daily life. *A super cute treehouse cabin to share with 1-2 lovely ladies. *Learning to find your inner and outer balance workshops. No charge to register. First payment of $250 will be billed on 2/20 and the second payment of $250 will be billed on 3/20. You have been invited to a special event. Your host gave you a code. Enter it in the coupon code area to receive your discount and also to be added to the correct event. Hangouts are private events for groups. The morning of the Hangout you will receive arrival instructions via text. Studio is not climate controlled so dress accordingly. You will be added to the Hangout once it has reached the minimum occupancy. Should the hangout not reach minimum participation, you will be able to use this pass for any regularly scheduled class. Class size is limited and equipment needs to be reserved. Once a pass is purchased it is not refundable for any reason. You may use it for the Hangout you have been invited to. You may transfer the pass to a regular class. Classes can be rescheduled without penalty provided a 48 hour advanced notice is given. If less than 48 hours the pass is not refundable or transferable for any reason. Good for a combination of 4 classes at Tamina or Salt Remedy and unlimited group classes at 2920 location. Come to class as often as you'd like. Good for unlimited in studio classes per month at the 2920 Studio. What? Drop in rates are $30 per class. Price is good for an entire year as long as you do not cancel. Monthly subscription for four classes. Can be used for classes at our Tamina Studio, Salt Remedy, or our 2920 location.